Born: 13 November 1814, Courcelles-les-Lens, Pas-de Calais, France. Died: 30 May 1850, At sea, off the West African coast. 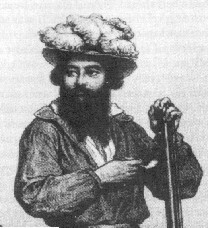 Adulphe Delegorgue, French hunter, naturalist, collector and author, was orphaned at the age of four and brought up in the home of his grandfather at Douai, near his birth place, where he largely educated himself and was introduced to natural history. Though he had inherited enough to be well provided for, he joined the merchant navy at the age of sixteen, travelling among other places to West Africa and the West Indies. Five years later, probably inspired by Le Vaillant's* Travels..., he decided to undertake a journey of exploration in southern Africa. By this time he had acquired the skills of a naturalist, including taxidermy, preparation of all sorts of specimens, keeping records, and drawing illustrations, though he was rather weak in taxonomy. He also appears to have been able to communicate in Dutch. He intended to collect specimens to sell in Europe, and of course to hunt for sport. Arriving in Simon's Bay in May 1838, a mere 23 years old, he remained in the Cape Colony for some time, travelling up along the west coast, across the Berg River and on to Verlorevlei in September. This was followed by a journey on horseback to the Hantam, returning to Cape Town via Verlorevlei in January 1839. On 5 May that year he sailed for Natal in the Mazeppa, in the company of J.A. Wahlberg* and F.C.C. Krauss*. He travelled, hunted and collected widely in KwaZulu-Natal, sometimes with Wahlberg. A hunting trip southwards to the Umzinto River took place in 1839; early in 1840 he witnessed the final assault on the Zulu king Dingane; he travelled into Zululand again in October 1841, accompanied to the Tugela River by Dr. B. Poortman* of Pietermaritzburg. He visited Mpande's kraal in December 1841, travelled to Lake St. Lucia, and was back in Port Natal in May 1842. In August of that year he went on another hunting trip to Zululand, with Wahlberg and others. In the Berea forest near present Durban he collected the type specimen of the Eastern Bronze-naped Pigeon which he named after himself, Columba delegorguei. In May 1843 he travelled to the Free State and on into the Transvaal. From Potchefstroom he crossed the Magalliesberg and followed the Limpopo River down to its confluence with the Marico River, where he stayed for about two months. He visited the Tswana chief Pilane, met Wahlberg again in October 1843, and travelled northwards as far as the tropic of Capricorn. During his travels in the Transvaal he discovered and collected the Harlequin Quail, Coturnix delegorguei. Returning to Port Natal in April 1844, Delegorgue left South Africa for France, via St. Helena. For the next few years his time was taken up with the preparation and publication of his two-volume book, Voyage dans l'Afrique Australe..., which was published in Paris in 1847. It contains a detailed account of his travels and adventures, and includes a sketch map of KwaZulu-Natal, a Zulu vocabulary, a catalogue of lepidoptera, entomological notes, and a description by an anonymous author of the new species Columba delegorguei. He also published a paper on the customs of the Zulus and Mantati, "Moeurs des Cafres amazoulous et Makatisses", in the Bulletin de la Societé de Geographie de Paris in 1847, as well as some notes on the habits of the lion in Revue Zoologiue the same year. Early in 1850 he left France on another expedition, this time to West Africa, but died of malaria along the West African coast. The species named after him include the South African stinkbug, Encosternum delegorguei. Delegorgue, A. Travels in southern Africa (Vol. 1, transl. F. Webb). Pietermaritzburg: University of Natal Press, 1990. Johan August Wahlberg. Travel journals (and some letters), South Africa and Namibia/Botswana, 1838-1856. Cape Town: Van Riebeeck Society, Second Series, No. 23, 1994. "Korte schets van eene binnenlandsche reis in Zuid-Afrika, van 1839 tot 1844, door monsieur A. D'elegorgue". Het Kaapsche Grensblad, 1 August 1844, p. 3. Standard Encyclopedia of Southern Africa (SESA). Cape Town: Nasou, 1970-1978.